The Men's defending champions Frisch Auf Göppingen are undefeated in 23 matches but if they want to win the trophy for the third straight time they have to beat last year's finalist Füchse Berlin in the semi-final. Both semi-final pairings of the Ottostadt Magdeburg EHF Cup Finals were determind by a draw in the Rathaus (City Hall) of Magdeburg on Wednesday and the hosts of the tournament SC Magdeburg were pitted against the only non-German team Saint-Raphael Var Handball from France. Lutz Trümper, the lord mayor of Magdeburg together with Martin Hausleitner, EHF Secretary General, conducted the draw. "It was in Magdeburg last time we lost an EHF Cup game two years ago and we hope we do not stop the streak in the semi-final. We know each other so well, so it will be difficult to surprise the opponents, but we will try to do the same like we did in the last year's final," Frisch Auf representative Alexander Kolb said. "All four teams have a good opportunity to win the trophy as they are all on the same level. We want to do it for our fans as we are hoping with them in our backs it will be easier than last year. We are glas with Saint-Raphael as our semi-final opponents as we always prefer an international opponent. 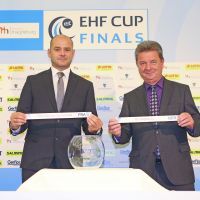 This is a true spirit of an EHF competition," Marc-Henrik Scmedt from the hosting club SC Magdeburg said. His counterpart from Saint-Raphael Emeric Paillasson commented: "Always when meeting two German teams within two days we know it is going to be tough, but having Magdeburg in the semi-final is the strongest opponent we could get." The European Handball Federation has already determined the playing times for all four games of the tournament. The semi-finals on Saturday 19 May will be played at 14:15, respectively 17:00 and on Sunday the third place match is scheduled for 12:45, while the final is set for 15:15. The GETEC Arena has already been nearly sold out, and last few hundreds of tickets are still available through the SC Magdeburg ticket shop here. The ticket prices range from 49 to 139 € and the tickets are valid for all four games of the weekend.